Everything is still going very nicely on the new job. Every day there are more positive comments. Quite a change, actually. Today's conglomeration began with the necktie, as usual. It's a switch for me and my first Charles Tyrwhitt. I was really wanting a bit more of that English bold and bright coloring for a change of pace but ended up with a regular gold colored tie with blue dots. So it goes with Ebay sometimes. Really, though, I just wanted to try one of their ties to see how they suited me, so to speak. 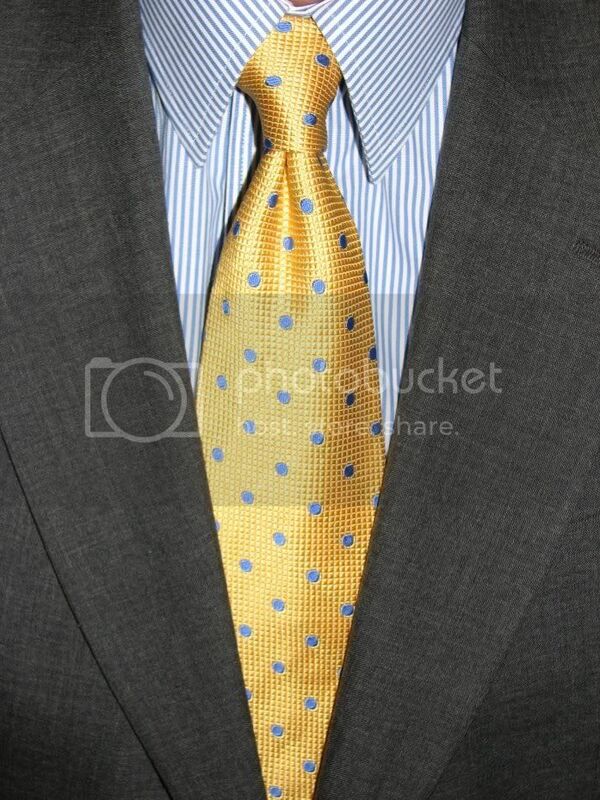 The texture of the weave is quite substantial and makes the tie far more interesting than a regular gold, blue dotted tie would normally be. Maybe I should try harder for a Turnbull and Asser tie if I really want bolder colors. Besides, if anyone asked about it, it would be cool to say, "Yeah, it's a real Asser!" Or, "This one's so bright it'll turn a bull!" The dress shirt is a Land's End, blue stripe, straight collar. Nothing special at all. The collar is a fair bit higher than most I have which makes it able to handle the thick knot the tie produced. The collar will not come together at the top in the inverted V that "They" say is so important. The gray sport coat tops it off although I think the navy would have conglomerated just fine.